‘Yellow jackets’ is the name given to the social movement, taking place since mid-October. The movement which started when the price of gas per liter was raised, widely criticized by daily commuters, quickly escalated to all other issues concerning people’s daily life. Among them, buying power; some feel like getting to the end of the month with low salary and always increasing prices is a reality a lot face. On another note, some territories feel abandoned, for example in La Reunion (French region, and island situated in the Indian Ocean), a massive demonstration took place, to criticize the expensive coast of groceries, among other goods, way higher than in France, felt unfair by the population. The movement roots in May 2018, when a daily commuter, Priscilla Ludosky, creates a petition, calling for lower prices on gas, targeting the new regulation the state will put in place starting January 1st, 2019. Five months later, on October 10, 2018, two automobilists , Eric Drouet and Bruno Lefevre, called for a general strike on social media, they were inviting people to protest against the new regulation, by blocking roads, highways, roundabouts. Initiative copied by a lot of people throughout the country, it quickly became a national movement. The first national strike took place on Saturday 17th, according to the Minister for the Interior, Christophe Castaner,there were around 283.000 protestors across France, in approximately 2000 occupied sites (roads, roundabouts…). This day, 409 persons will be injured, and almost 200 people arrested. The highlight of the day is, unfortunately, the death of a demonstrator. In Savoie, a woman disturbed by the chaos created by the protestors, allegedly ran over one, trying to get through, to get her daughter to the doctor faster. All across France and even outside, the movement is on the rise. In Angers, on the 23rd, a man threatens to commit suicide, with an explosive collar, if the yellow jackets are not received by the president. After six hours of negotiations, he will finally be arrested. On December 1st, another protestation is organized. A lot of police forces are barricading all around Paris, trying to contain the protestation. The Champs-Elysées, one of the most famous (If not the most famous) avenue of Paris is targeted. Usually, this emblematic road is used to celebrate, whether it’s the French team winning the world cup, or National Holliday, but this time it was far from a celebration. Due to a large crowd, protestors took over the police and occupied the space for the rest of the day, which followed with altercations between the protagonists. This video is a footage of the event, please be advised that these images may shock. Whichever fault it is, not less than 150.000 people were protesting across France, according to the government. The Police Syndicate will later counter this number, stating that according to them, there were around 800.000 protestors , across the country. Extremely different figures stated. Where public opinion stands is hard to understand in this kind of situation. 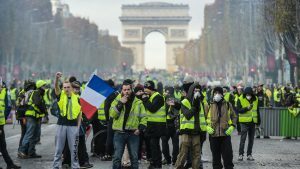 The yellow jackets, who started protesting against the price of oil, are now protesting for other things, such as: A rise in benefits for retirement, taxation on big companies, protection of French industry, the end of austerity and a general upgrade of social services. The movement not being structured, it is sometimes hard to grasp what are the expected changes. Mix with that a few bad people, taking advantage of the protest to destroy things and a President that stands on his position, and you get a divided population, supporting changes, but also condemning all sorts of violence. A beautiful mess, leading so far, nowhere. The international press quickly reacted to the news, the Spanish Journal El Pais, reports a ‘President on the Edge’. The violence of December 1st brought a wave of concerns worldwide, The Times correspondent in Paris explains that the French Capital became ‘A war zone’. Canadian Press, on the other hand, take the events from a different perspective, and see in the event, a raising concern among rich countries’ population: ‘There is a parallel between what is happening in France and almost all developed countries, including Canada, as comfortable urban elites seek to impose their climate change agenda on a larger population struggling to pay his bills.’ (Source). The situation in France is really complicated but does show a general discontentment from the population. Even though it is a rich country, where wealth distribution and social services work to some extent, the population still feels like receiving an unfair treatment. An interesting debate is taking place on the other side of the Channel. Gilets Jaunes in Paris on December 1st.